Christina was a beautiful young lady full of life. She touched everyone she came in contact with her upbeat personality and radiant smile... she was called home all too early and we were blessed to have had her presence. Christina was well liked and always had great respect for the members of her church. She had one of the greatest privileges of all; she lived with her grandparents, in California. While living with her grandparents she had the pleasure of spending time with her friends and family, which she enjoyed the most. She had a loving personality that made her a very pleasant person to be with. Christina was special to her friends and family, everyone enjoyed her companionship she will be truly missed. Christina was a fun and loving person, she always had a smile on her face.. she loved to dance and sing.. she was a lover of family and friends. Christina , short lived life was tragically ended in Albg New Mexico. 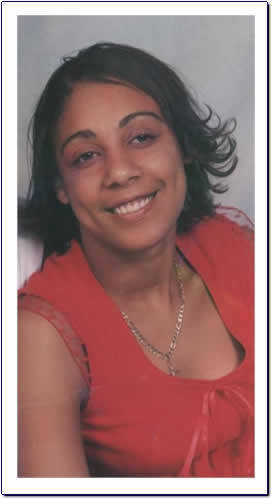 on June 26, 2002, Christina was murdered and shot Several Times, she was in the wrong place at the wrong time. the gunman shot another woman and himself. She was only 18 years old .. She will forever be missed.. we love you Christina Grannie And Grandpa Stansberry Auntie Joyce, uncle Jiles Candice and Rodney.. Celesse, LaTanya,T'yuana Jr. Natasha R. Christina RIP: Uncle Ike and a host of other family members and Friends.